The race for a Reusable Spaceplane Prize would grab the whole world's attention. After all, the nation that builds the first true reusable spaceplane will be in a position to dominate the much broader global commercial space industry. The nation that leads in spaceplanes will capture new markets opened by this industry, such as satellite servicing, tourism and medical breakthroughs from zero-gravity research. From all this will flow even more innovations, businesses and jobs. 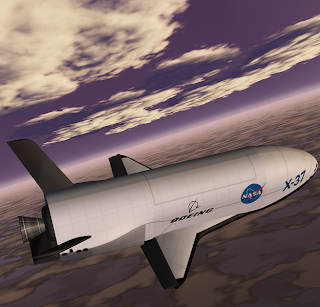 Spaceplanes will also transform U.S. national security. In 2001, for example, Congress sponsored a bipartisan Commission to Assess United States National Security Space Management and Organization. In its report, the commission warned that the U.S. is in danger of a Pearl Harbor-type attack in space. Push prizes are a great way to get a lot of development done for a relatively low seed investment. We recently discussed the Google Lunar X Prize on FastForward Radio. That prize is a whopping $30 million for the team that can land a mini-rover on the moon that travels a short distance and collects some basic data to be sent back to Earth. This is a great idea not only for jump-starting a new era in exploring, developing, and settling space, but also for putting NASA back in the inspiration business. NASA needs to become the National Administration for Big Hairy Audacious Goals in Space. Go NABHASG!